Supports Pale Moon [25.0a1pre - 28. *], Firefox [1.5 - 56. *], and SeaMonkey [2.0a1 - 2.40]. NOTICE: The Browser you're using may not be supported by GaiaFormat. If you believe this to be in error, please check your browser's User Agent settings. GaiaFormat is free software supported by donations, not advertisements. 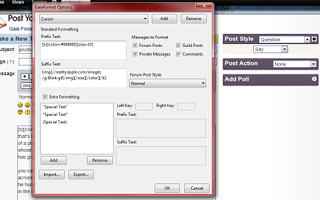 The GaiaFormat extension was originally created as a stripped-down version of the TekTek toolbar, with only the post formatting abilities for space and efficiency. Since its initial version, there have been updates to much of the code, including a more built-in feeling for some of the features, and an entirely new feature, which I hope will be quite useful to the members of Gaia: Extra Formatting for text within key characters. Extra Formatting means that any text within "quotation marks" can be formatted especially, for example. It also means that the user can just hit Submit instead of wasting time setting up every post exactly the way he or she wants it to look. Since GaiaFormat's final release for Firefox in May of 2016, Mozilla has abandoned its own technologies in favor of poor parody of Google's protocols (WebExtensions), leaving many developers, including this one, disillusioned with the direction the Mozilla is taking. In contrast, Pale Moon has stepped into place as an XUL-centric browser, keeping backward compatibility better than Mozilla's own flagship project. So, for now, GaiaFormat may be considered a Pale Moon and SeaMonkey extension that still supports older versions of Firefox. GaiaFormat is free for use or modification without limitation. However, it comes with no license, warranty, or guarantee of any kind. That being said, you can still ask any questions in the Comments section below, or contact me directly for assistance. Be the first to post a comment about GaiaFormat! What do you get if you multiply one by three?